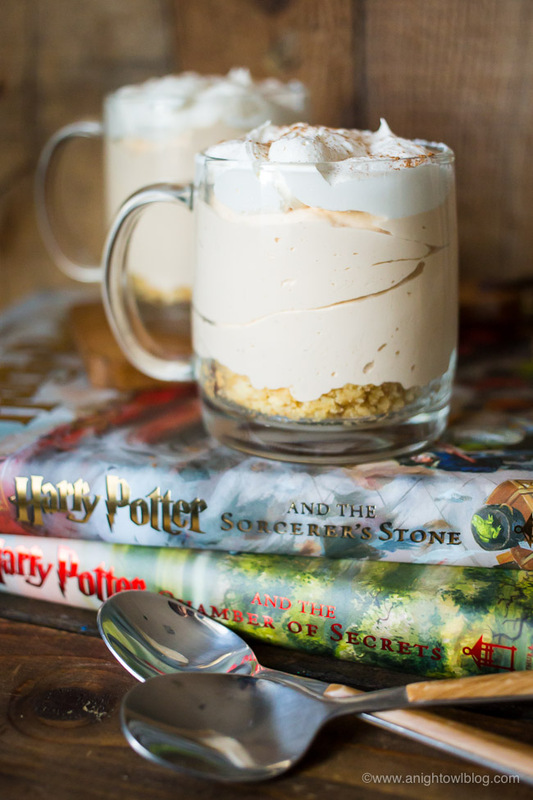 Perfect for fans of Harry Potter, this No Bake Butterbeer Cheesecake is easy to whip up and tasty too! Happy Birthday, Harry Potter! I can remember the summer I was given the first book to read. 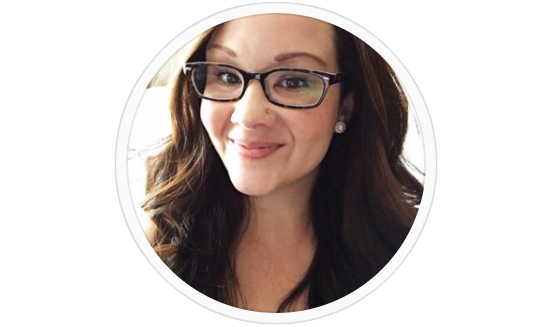 I was home from college on summer break and while I wouldn’t call myself an avid reader, I clearly recall not being able to put the book down! 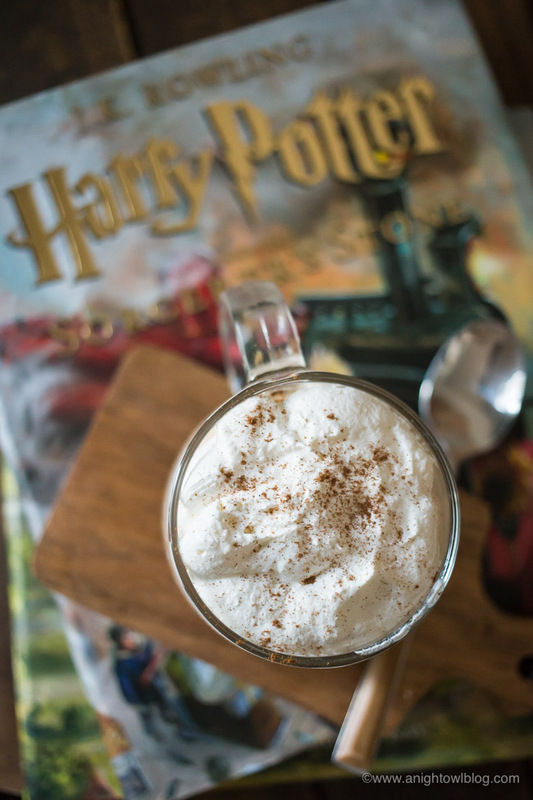 It was at that moment that Harry Potter had caught my attention, captured my interest – and I couldn’t wait for more. Since then, I’ve of course read all of the books, watched all the movies and now I’m getting to relive all the fun adventures through the eyes of my older boys. We grabbed the first two illustrated books and have started reading them this summer. There’s nothing better. 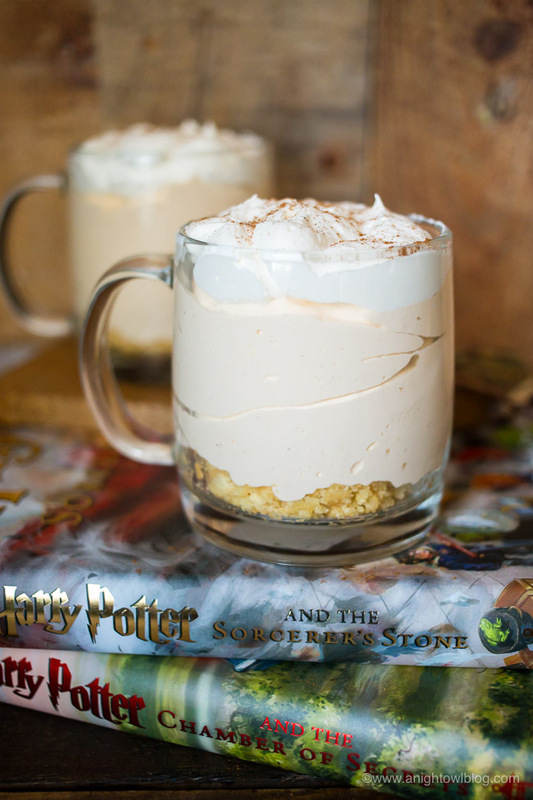 So on this birthday I’m happy to share one of my favorite recipes to date, inspired by the series – our No Bake Butterbeer Cheescake! Preparation is easy! 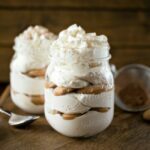 In a bowl, simply whisk together Butterscotch Instant Pudding, cream soda and half and half and set aside for a five minutes. 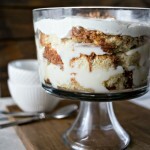 Once partially set, beat together the pudding and softened cream cheese until smooth. Once combined, fold in 2 of Cool Whip and refrigerate until you’re ready to serve. 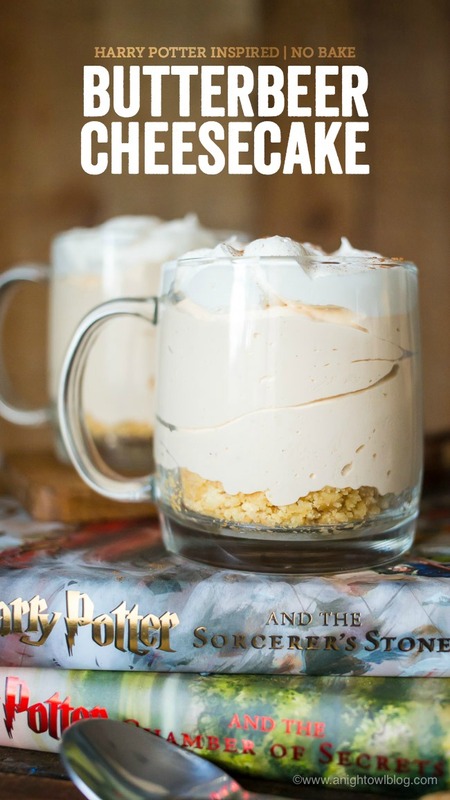 Once you’re ready to serve, we suggest transferring the Butterbeer Cream Cheesecake into a plastic bag and piping into jars for easy eating! But first, give those Golden Oreos a good smashing and mix in some melted butter for the crust. Easy and delicious! 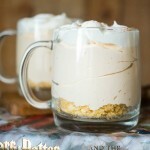 I served the cheesecakes up in little glass mugs, I thought it gave the dessert a fun “Butterbeer” feel. I also used the remaining Cool Whip to top the dessert off and sprinkled a little cinnamon on top. Just adorable. 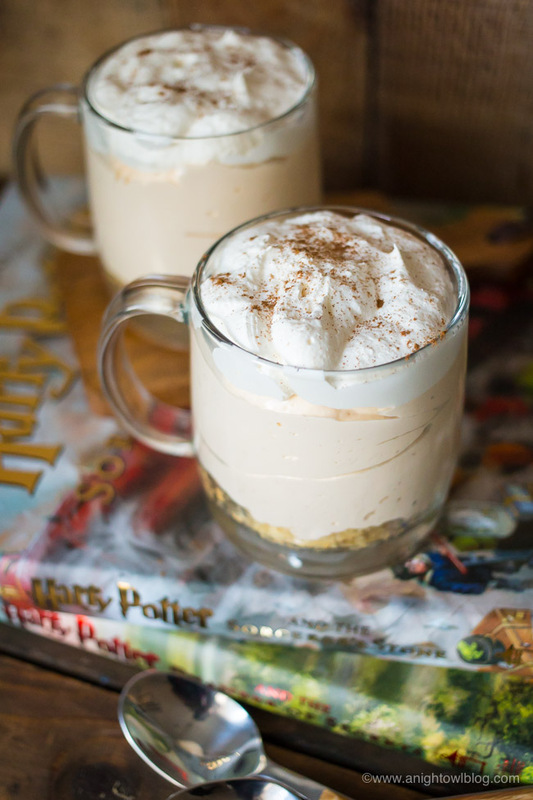 So if you’re looking for a fun Butterbeer treat to whip up – to celebrate Harry Potter’s birthday, for a fun movie night OR for the ultimate Harry Potter party – you have to give our No Bake Butterbeer Cheesecake recipe a try! 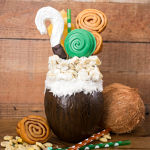 In a bowl, whisk together the Butterscotch Instant Pudding, cream soda and half and half. Once well combined, fold in 2 cups of Cool Whip and refrigerate. When ready to serve, crush Golden Oreos and combine with melted butter. 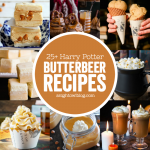 Form a crust at the bottom of your serving dishes then top with butterbeer cheesecake. Top the cheesecake with remaining Cool Whip and sprinkle the top with a dash of cinnamon. Oh do let us know what you think, Jennifer!